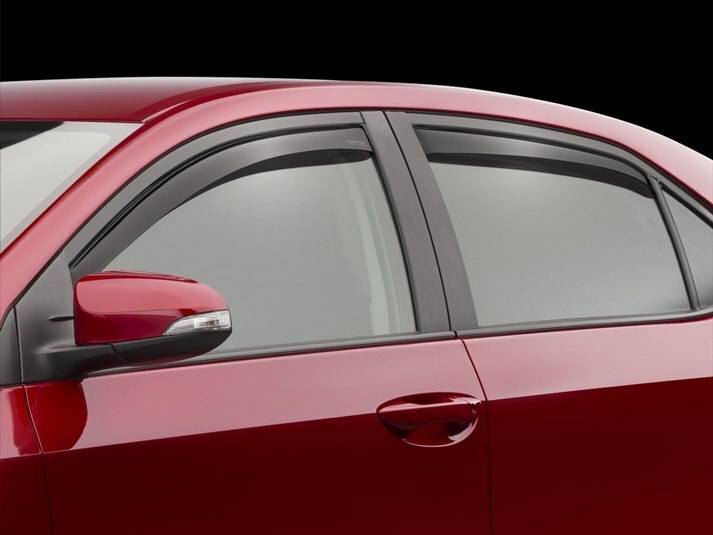 WeatherTech Side Window Deflectors are precision-machined to perfectly fit your 2014 Toyota Corolla's window channel. These low profile window deflectors help to reduce wind noise and allow interior heat to escape. Our light tinted Side Window Deflectors are the only deflectors in the world made with a D.O.T. (U.S. Department of Transportation) approved glazing material. Available in light and dark tint for most vehicles. Designed and Engineered in USA – Handcrafted in Germany. Sleek look and easy installation. These were easy to install and in my opinion look better than the stick on deflectors. They seem really solid after install , at first I was worried about them coming out of the channel but they seem to be firmly in place. You need too make sure you follow the instructions as it may be harder to roll up the window the first few times. I have had a couple sets of the stick on deflectors on other cars and the quality of the Weathertech is superior and functions better at keeping water away also. Based on the quality of this product I made a few other purchases from Weathertech and I am very happy. I feel that I have been ungratefull as I have not posted any review for the wind deflectors.Living in Miami it has been a huge difference since I got the four WD for my 2005 Corolla. Even in August and under the sun the car temperaturare has lower a lot when parked. And in Miami winter I just drive the car (city) with the windows open about 1/2 inch and I get the wind circulation with A/C turn off. I kept asking to myself why I hardly see any car in this hot and humid Miami with wind deflectors. Probably they don't even know they exist. Once again, thank you very much for a wonderful and useful product. Besides, the Corolla upholstery still looks like new as cabin temperatures are much lower. Be well and don;t hesitate in getting the four WD, moreover if you live in the South!!! During a trip to Houston, I left a plastic water bottle in my car while attending a meeting. Upon entering my car that afternoon, I noticed that the interior was so hot that the water bottle had actually begun to collapse on itself. This prompted me to purchase the WeatherTech deflectors. They ventilate the car during the day and prevent excessive heat build up. I would estimate that the interior is at least 20 to 30 degrees cooler...should have gotten then sooner!